Practice has wrapped up at the famed Daytona International Speedway. The skies have opened, after a few overcast days, providing ideal conditions for practice. First, let’s hit the news front. Lucas Oil/Troy Lee Designs 250SX rider Malcolm Stewart is making his 450SX debut at his hometown race. Also, both Kyle Chisholm (shoulder) and Weston Peick (back) had crashes earlier in the week and will not race tonight after giving it a go in the first practice. GEICO Honda’s Eli Tomac had a big crash in the second practice and had to leave early. No word on his condition for tonight at this time. Honda Muscle Milk's Justin Barcia is back after sitting the past two weekends with a knee injury. He struggled in practice due to crashes and finished tenth. Although the track will be shorter this year, thus decreasing lap times, it is as rough as ever. Riders were struggling all day in the deep, rutted whoops. A rider showing no signs of weakness on the difficult track was Dean Wilson. In just his second career 450SX race, Wilson, filling in for the injured Chad Reed, set the fastest 450 time with a 1:05.968. Current points leader Ryan Villopoto was second on the day (1:06.218), but it didn’t come without troubles. In the second timed session RV high-sided and hit the ground hard. He did remount and finish the practice, so everything should be a go for RV tonight. 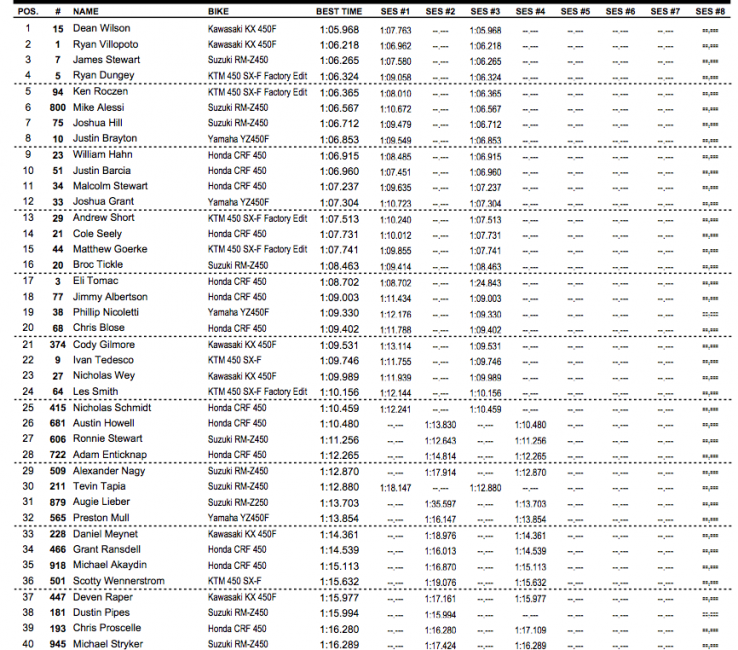 Third was James Stewart (1:06.265), who also hit the ground hard in the first timed session. 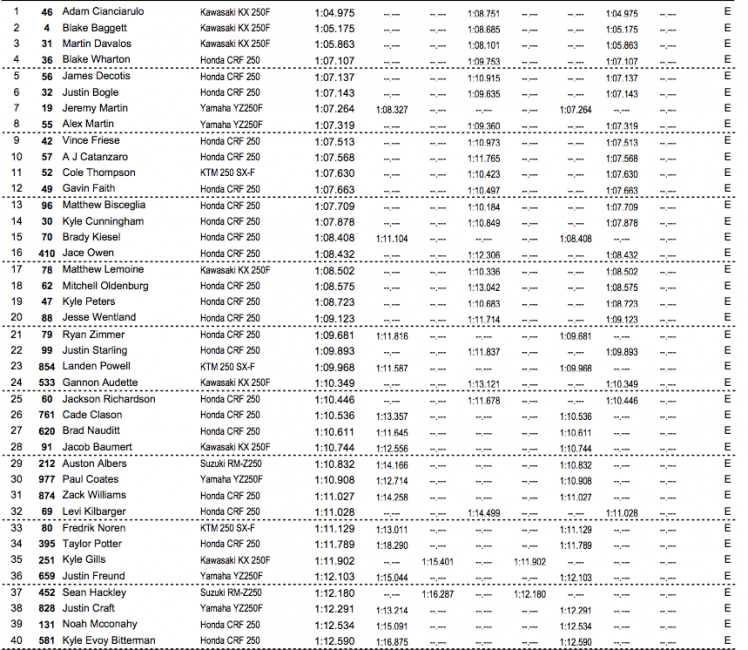 Ryan Dungey (1:06.324) and Ken Roczen (1:06.365) would round out the top 5. Monster Energy/Pro Circuit Kawasaki were again the head of the class in practice—going 1-2-3. Adam Cianciarulo was attacking the tough track and set the fastest time of the day with a 1:04.975. Baggett (1:05.175) was second on the day but took a big spill in the first timed session. He reportedly is suffering from a bruised wrist following the crash. If the cards play out like they did in practice, Pro Circuit could be looking at another podium sweep. GEICO Honda’s Blake Wharton (1:07.107) was fourth fastest on the heels of a tough race in Indy. Privateer Jimmy Decotis (1:07.137) and Justin Bogle (1:07.143) would round out the top six. Tonight’s action will air live on Fox Sports 1 tonight at 7:30 ET.